This is cold weather comfort food. Pretty quick recipe to make as there is no need to soak the peas. It is loaded with flavor with the bacon and the ham. If necessary, thin it with water when reheating. Really delicious!! Heat butter in large Dutch oven over medium-high heat. When foaming subsides, add onion and 1/2 teaspoon salt; cook, stirring frequently, until softened, about 3 to 4 minutes. Add garlic and cook until fragrant, about 30 seconds. Add water, ham steak, bacon, peas, thyme, and bay leaves. Increase heat to high and bring to simmer, stirring frequently to keep peas from sticking to bottom. 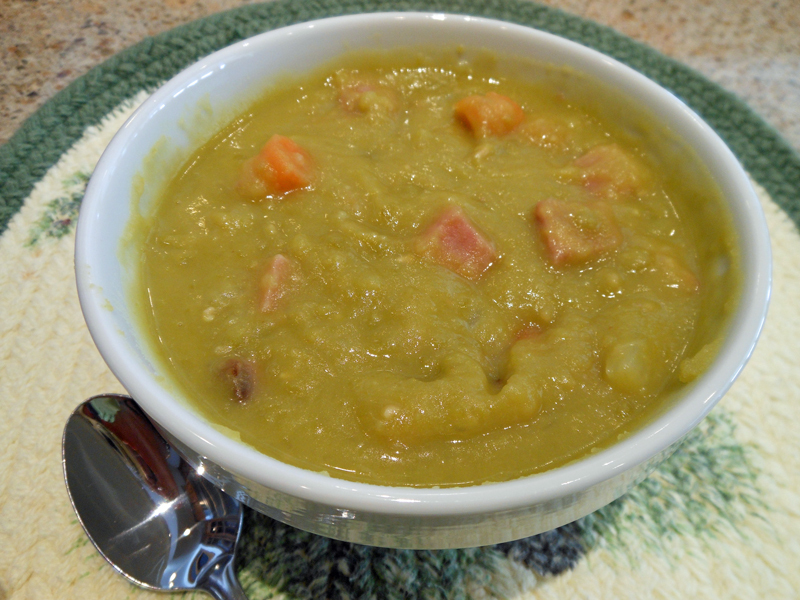 Reduce heat to low, cover, and simmer until peas are tender but not falling apart, about 45 minutes. Remove ham steak, cover with foil or plastic wrap to prevent drying out, and set aside. Stir in carrots and celery; continue to simmer, covered, until vegetables are tender and peas have almost completely broken down, about 30 minutes longer. When cool enough to handle, shred ham into small bite-size pieces with two forks. Remove and discard thyme sprigs, bay leaves, and bacon slices. Stir ham back into soup and return to simmer. Season to taste with salt and pepper; serve. Try gently fried croutons on top of soup for a perfect finish.